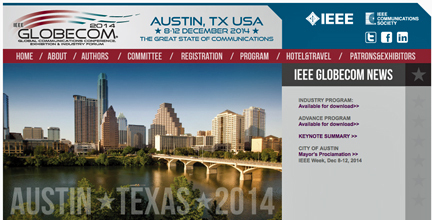 [SatNews] Join the thousands of international communications experts at IEEE GLOBECOM 2014, which will be held from December 8 – 12, 2014, at the Hilton Austin in Austin, Texas. This premier international event is devoted to driving innovations in nearly every telecommunications field. This 57th annual event is dedicated to the latest IoT (Internet of Things), networking, broadband, cloud computing and emerging technology breakthroughs. Dr. Edward G. Amoroso, Chief Security Officer, AT&T Inc., who will speak on the “Recent Advances in Cloud Security"
Dr. James Truchard, President, CEO, and Cofounder of National Instruments, who will address “Next-Generation Tools for Next-Generation Wireless Research"
Dr. Wen Tong, an Huawei & IEEE Fellow, who will talk about “5G Wireless Beyond Smartphones"
Dr. Alicia Abella, Assistant Vice President (AVP), AT&T Labs, who will discuss “Cloud Computing: A New Strategic Infrastructure"
Rajesh Pankaj, Senior Vice President, Engineering at Qualcomm Research, who will explore the “Future of Wireless"
Additional details, including a complete agenda of events, are available at http://www.ieee-globecom.org/2014.